While I was freezing up north it was 65-70 degrees down here. As soon as I flew home, however, the South decided to chill up a bit. I’m trying to not take it personally…but, well, I want it to be warm! Seriously, if I end up at University of Montana this fall, I’m not sure how I’ll survive. I bet apartments and houses in Missoula come equipped with central heat and/or fireplaces, which would help a lot, but I’m a southern girl who thinks the perfect weather is 70 degrees and sunny. In lieu of central heat, I made a pot of roasted butternut squash barley risotto. A little over a year ago I made barley risotto and thought it was pretty good–definitely stick to your ribs, warm your soul good. After making the “beef,” barley, and leek soup in October, I had a cup of barley left over. I also a small butternut squash leftover from my 1st vegetable husband basket. With nothing else in the house (other than pantry items), it was time to experiment. While there are plenty of barley risotto recipes and butternut squash arborio rice risotto recipes, I couldn’t find any (online) that married the two ingredients. For a bit of greenness, I threw in mustard greens and called it a day. Overall, I like it a lot. Barley takes a long time to cook–definitely longer than 1 hour–so plan accordingly. The roasted butternut squash added a creaminess to the risotto that I think is key, and was missing the last time I made a barley risotto, and the greens were a great addition. Halve the butternut squash and deseed. Spray insides of squash with spray oil and lay them upside down in a roasting pan. Roast for 45 minutes or until tender. Meanwhile, in a medium pot (8 qt), saute the onion in the olive oil until translucent. Add the barley, thyme, bayleaf, and garlic. Cook for 30 seconds. Add 2 cups of the vegetable stock; bring to a boil. Lower heat to a simmer until most of the liquid is absorbed. Continue adding stock half a cup at a time until the barley is tender. After the butternut squash has roasted and cooled, peel the skin off and cut the squash into half-inch dice. Once the barley is tender, add the butternut squash, mustard greens, and parsley to the pot. Cook for 3-5 minutes. Season with salt and pepper. So many ingredients that I love separately and sound fantastic together- What could be better? I’m completely craving this now! This looks so good! I love butternut squash in anything, but this looks spectacular. I’ll definitely be making it. I hope it starts warming up for you soon! So steamy! Wow, I didn’t know barley took so long to cook. Thanks for the tip! I hope the weather warms up soon down there! Montana is cold but it’s such a beautiful state though, isn’t it? wow! 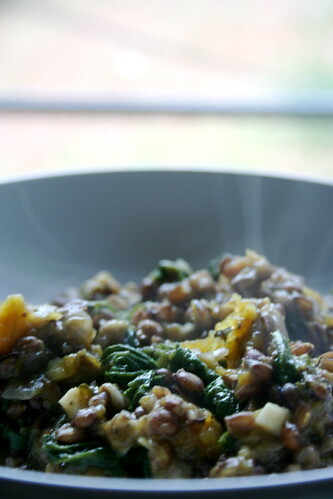 you roasted butternut squash barley risotto looks absolutely awesome! we’ve got a butternut squash that’s just been sitting around – perhaps we’ll give this a try! i love a good stick-to-your-ribs kinda meal, especially one with greens. delicious, indeed! stay warm! Here’s a trick: if you have a steamer with a rice bowl, you can steam the barley for the first hour or so. Just treat it like rice, but with a much longer steaming time. We used to do that with wheat berries, and they turned out wonderfully: all plumped up, yet whole. That way you wouldn’t have to hover over the stove for so long. Montana? That’s crazier than moving to Scotland! That looks so yum! I so wish I could find me some butternut easily – it’s not a native food so not always easy to find! But oh I do love it so!